We’d love your help. Let us know what’s wrong with this preview of Kiss By Kiss/Ocêtôwina by Richard Van Camp. Orca B One kiss, two kiss, three kiss, four! So many kisses and so many more. From bestselling author Richard Van Camp comes a delightful counting book that honors families and can be used to praise your little ones as they learn to count. Ten kisses from your sweet baby might not be enough to get you through this adorable book, so you'll just have to read it over and over! 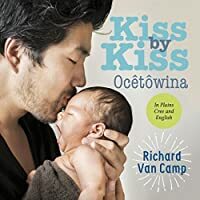 To ask other readers questions about Kiss By Kiss/Ocêtôwina, please sign up. Thanks to Orca Book Publishers and NetGalley for the review copy, in exchange for my honest opinions. Board books are excellent ways to have kids get used to the idea of books in general. And what a delight to find books that have both English and Plains Cree narratives. This book is one in a series of books with the dual languages. Babies love bright colors. They love to see themselves in books, and it is wonderful that this series is there so that it can be shared in both Plains Cree and English. Written in Cree as well as English, this board book is full of fun smooches and counting. I cannot assess the Cree but the English text is easy to read and lovely and the pictures are wonderful, full-color, with diversity. Definitely a must-buy for any library with a baby book collection. The text is sweet, the families diverse and the bilingualism is interesting. A board book with diverse pictures of loving families and friends! Follow along as kisses are counted in both Plains Cree and English. Definitely a warm, cuddly board book! perfect, sweet board book. diverse and loving. funny too. This is one of the sweetest board books for babies and toddlers I have ever read! Written in English and Plains Cree, this is a simple counting book that your child will love. The photographs are simply beautiful, include all generations and diverse families and show children kissing their loved ones. Board books are excellent ways to have kids get used to the idea of books and knowing how to hold and manage books from an early age. This book is one in a series of books with the dual languages. I This is one of the sweetest board books for babies and toddlers I have ever read! Written in English and Plains Cree, this is a simple counting book that your child will love. The photographs are simply beautiful, include all generations and diverse families and show children kissing their loved ones. I hope this author continues to write more books for young children for spatial concepts, plurals, pronouns. As a speech language pathologist who works with young children, I am always looking for new ways for children to learn these concepts, and share with families. "Kiss by Kiss" is a very sweet book. It is an introduction to counting by counting kisses and filled with beautiful photography of diverse families. There are several races pictured along with single parents, a family with two dads, and a child with a grandfather. "Kiss by Kiss" is a dual language book and features Plains Cree alongside English. For people new to Cree (like myself) there is a pronunciation guide at the beginning of the book. I received a copy of this book from NetGalley in exchan "Kiss by Kiss" is a very sweet book. It is an introduction to counting by counting kisses and filled with beautiful photography of diverse families. There are several races pictured along with single parents, a family with two dads, and a child with a grandfather.